What do you get when you cross two Irish brothers, two Frenchmen, and an Italian? No, there isn't a punch line, because this isn't a joke. 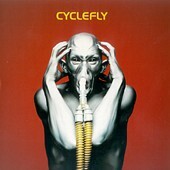 Instead, the answer is Cyclefly, a hard-drivin' rock band that can maneuver pop, hard rock, and modern rock in the same song, circling each genre they cross to form their own sound. And on their new album, GENERATION SAP, the band delivers eleven powerful tracks that should help them find an audience in America. The disc opener, "Violet High," demonstrates the hard rock/pop sensibilities of the band as they deliver a pounding rhythm and slivery guitars coupled with a melodic, carried out vocal presence that seems more at home in a softer setting, though it makes use of the environment it is in. Then there is "Whore," which starts out soft and drawn out with an artsy, colorful sound that is beautiful and warm. Then they shake things up with some more of their pounding rock antics. "Plastic Coated Man" starts out with a rock 'n' funk drive that quickly turns into hair splitting melodic metal, complete with distorted vocals and a razor sharp bite to it. Then they cook up a poppy, melodic piece that draws you in, before ripping things back up again with more of the fury that lies beneath everything. "Sump" thumps and burns while the album closer, "Slaves," starts out slow and builds to the point where the band is able to amp things up and shake you wildly with juicy beats and sharp guitars. Cyclefly has two sides to them: one is beautiful and soft, while the other is sharp and wicked. They can yell and rock out or they can softly get their message across. They've definitely got potential, that's for sure. This album has some high points and low points, but the majority of it is found in between those two. I'll give it a B-.